I use thumbnail sketches a lot. 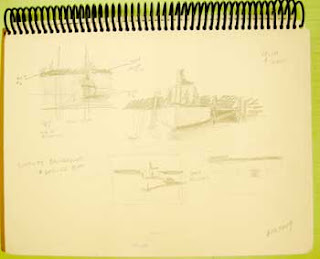 These little sketches work great to figure out where I am going to place the subject of my painting on my paper. I work out composition, values, and I work on eliminating things in the reference photos that are unnecessary. While working with my thumbnail sketches I write little notes to myself. This seems to help me do a lot of problem solving before I ever touch my watercolor paper. Here you can see a close up view of the thumbnail used for this painting. 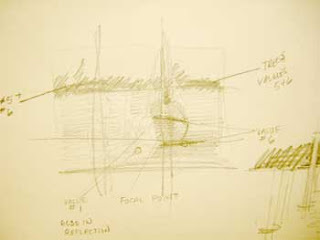 I use two horizontal lines and two vertical lines to check my composition. This is commonly known in the art world as the Golden Mean or Rule of Thirds. If your focal point falls on or very near one of the points where the lines intersect, you can be pretty sure that the composition will be a pleasing one.